The Purge was one of the surprise hits of 2013. Produced on a meager budget of $3 million, it went on to rake in over $89 million worldwide. The general consensus from critics was that the film had an interesting premise that was never fully realized. In the near future, United States has been restored by the New Founding Fathers of America, who have instituted the annual Purge. For 12 hours out of the year, all crime, including murder, is legal. 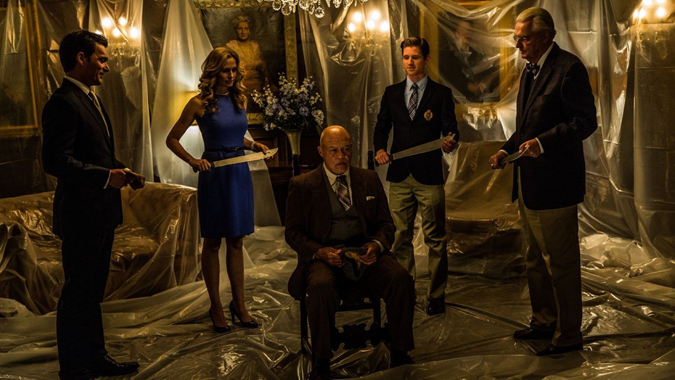 The NFFA expound the virtues of the Purge for lowering crime rates, unemployment, and poverty. Of course, they fail to mention that the poor are easy prey while the wealthy remain safe and sound in their mansions. The first film established the parameters of its high concept with Ethan Hawke as the patriarch of an upper middle-class family with a high-tech security system under siege when they give sanctuary to an injured stranger. 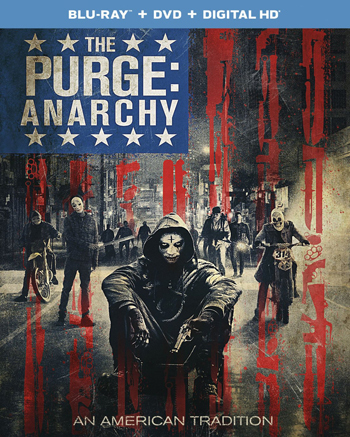 The Purge: Anarchy expands upon the world beyond the walls of a single suburban home and into the streets of Downtown Los Angeles. It shows just how everyone participates in the Purge, or at least, tries to survive it. The homeless hunker down in the subway tunnels praying no one finds them. The elite one-percent don’t even leave their homes to purge, not when they can simply order take out. Human beings are delivered directly to them to be hacked to bits by machete. Or they’re rounded up and hunted in an arena like a homicidal version of lasertag. Meanwhile, a fiery revolutionary named Carmelo Johns (Michael K. Williams) hacks into broadcast signals to spread his message of bringing down the New Founding Fathers. For Eva Sanchez (Carmen Ejogo) and her daughter Cali (Zoe Soul), the Purge means they board up the windows and hide in their apartment until the night is over. Shane and Liz (played by real-life married couple Zach Gilford & Kiele Sanchez) are more concerned about how to tell their family that they are breaking up. However, a creepy gang of masked thugs have cut their fuel line leaving them stranded in the city just before the Purge commences. Sgt. Leo Barnes (Frank Grillo) is fully prepared for the Purge. He’s bulletproofed his muscle car and loaded it with a stockpile of weapons. The Sarge is on a mission of revenge against a man who killed his son in a drunken driving accident. Writer/Director James DeMonaco is clearly influenced by the works of John Carpenter with The Purge owing a debt to Assault on Precinct 13. Not surprising since DeMonaco penned the script for the 2005 remake. Anarchy is reminiscent of Escape From New York as well as The Warriors. Don’t worry, there’s no need to see the first film to understand the sequel. Edwin Hodge, who played the stranger, is the only returning cast member. DeMonaco gets to play with triple the budget of the previous movie though that’s still barely a drop in the hat compared to big Hollywood blockbusters. Yet, Anarchy looks impressively slick with DeMonaco setting the mood with several slick aerial shots of the city at night. And there’s a lot of other cool imagery to compliment them, such as a pair of 18-wheelers roaming the empty highways for unsuspecting targets. A woman, armed with a machine gun and a bullhorn, expounds the wrath of god as she picks off random passersby. At one point, the protagonists drive by a dazed girl covered in blood and looking just like Carrie. One character jokes, “Maybe he deserved it,” when he sees a stock broker strung up in the banking district. By the way, the banks have moved their money to undisclosed locations in preparation for the Purge. Beneath the visuals is a story that lacks any nuance. DeMonaco hammers home his message with the subtlety of the Gatling gun used by the main antagonist. The rich and powerful are preening Caucasians dressed in tuxedos or prep school uniforms while the resistance fighters are obvious allusions to the Black Panthers. Shane and Liz are the least interesting of the protagonists, mostly there to state the obvious when they aren’t serving as the bickering Bickersons. At least Eva and Cali grow beyond their designation as damsels in distress. Frank Grillo really is the anchor of Anarchy. As the Sarge, he’s Charles Bronson, Kurt Russell, and the Punisher all rolled into one. It’s a shame he wasn’t able to take the lead in Joe Carnahan’s proposed remake of Death Wish, Grillo is a throwback to the action heroes of gritty 70’s era action flicks. The video is presented in 1080p with an aspect ratio of 2.40:1. The film was shot mainly at night with high definition digital cameras. The picture is bathed in yellow with deep blacks and colors slightly muted. The audio is presented in DTS-HD Master Audio 5.1. The sound is robust with a healthy dose of gunfire, explosions, and other forms of ultra-violence. The Blu-ray captures a little bit of everything from screeching tires to a scream in the distance. Behind the Anarchy (8:49) is a standard behind-the-scenes featurette that looks at how producers wished to explore further aspects of the Purge in the sequel and shooting on location in L.A. The Blu-ray also includes five deleted scenes. The Purge: Anarchy is a marked improvement over its predecessor. This is a lean, mean action movie harkens back to the exploitation genre of the 1970’s.